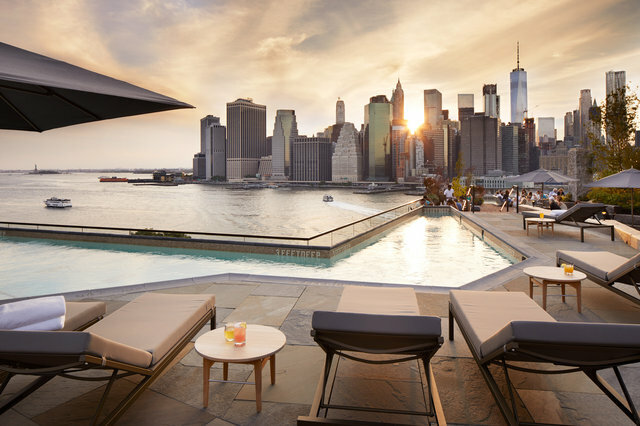 Escape Sale: Save up to 35% on selected Hotels! 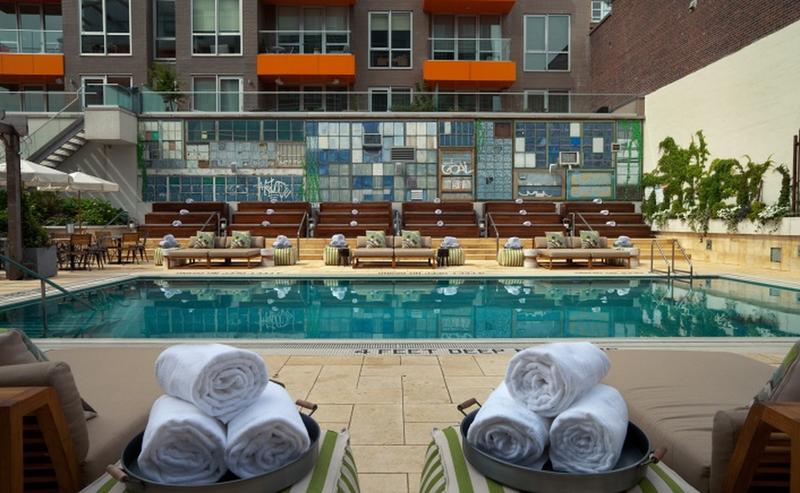 Mccarren Hotel & Pool: Brooklyn, NY. 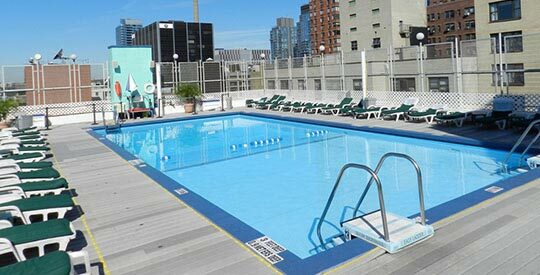 The hotel has a three season salt water pool and is one of the largest outdoor swimming pools in New York City. The pool offers 4,800 sq ft of deck space. Non-hotel guests can purchase a day pass 24 hours ahead of time, the pool will open early June daily 11am – 9pm. For pricing information click HERE. 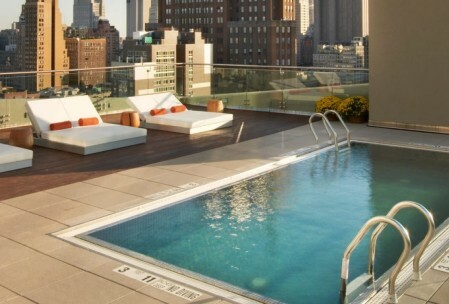 the pool is located in the Hotel Indigo’s 15th floor, this posh spot with terraces serves elevated bar food & cocktails. They have day passes available for those who want to go during the day. 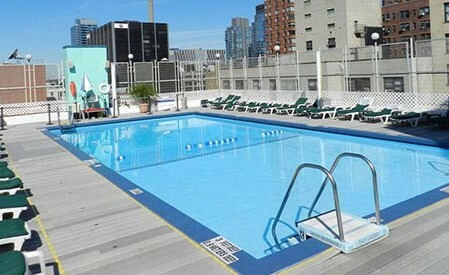 According to their events manager pricing is as follows: $50 per person for pool access and a couch area. Lounge chairs are reserved for hotel guests. These are available 11am-7pm, you just show up and pay upon arrival. 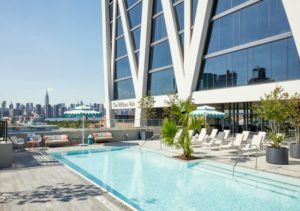 Pool use is open to the public from 1pm-6pm on weekends during adult summer pool parties (with a 21+ vibe). 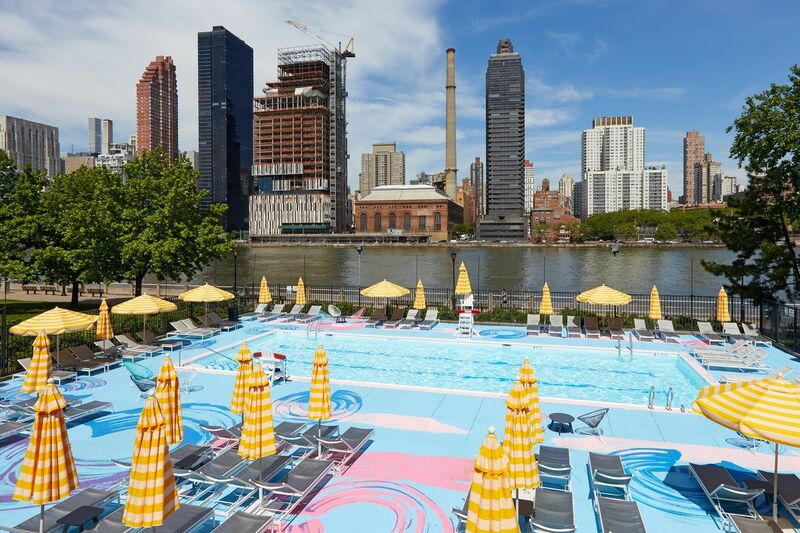 Reservations are required during the weekend summer pool parties (call beforehand to make sure they have opened it to the public for the season). 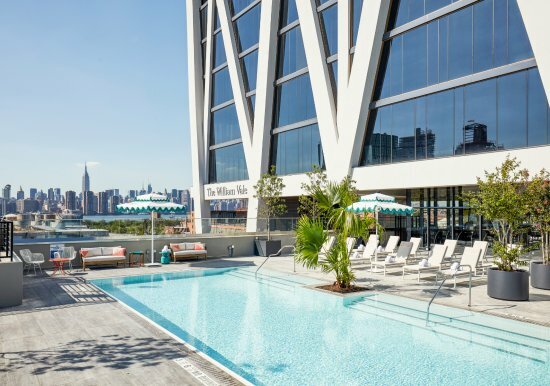 Located above Vale Park, “Vale Pool overlooks Manhattan’s skyline, and is the longest outdoor hotel pool in Brooklyn and greater New York City.” Non-hotel guests can purchase a day pass for two starting at $150. More information available HERE. The pool opens up Memorial Day weekend. Tickets start as low as $25 and can be purchased here. 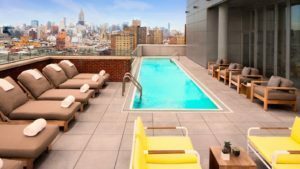 The hotel allows non-guests access to its 25-foot-by-50-foot pool on their 11th-floor roof deck for $100 for the day (make sure you bring cash). There is a bar you can grab a drink at while laying out in the sun. 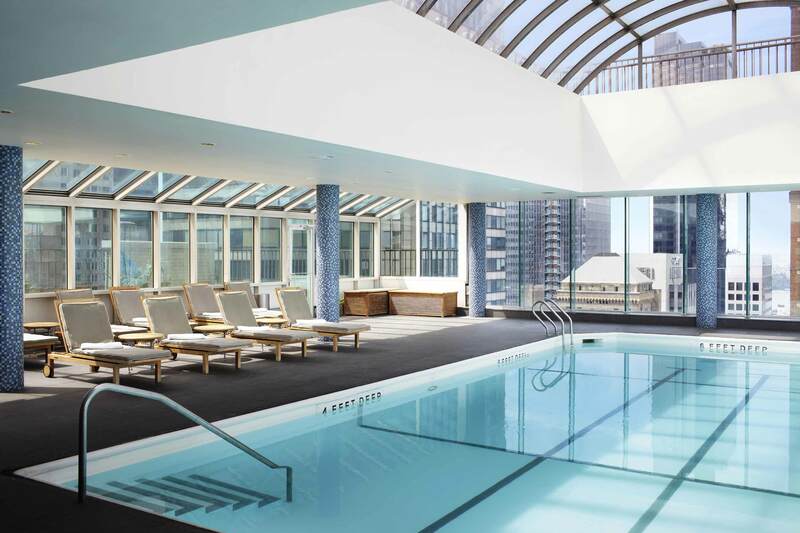 This indoor pool has a sundeck that offers guests views of Central Park. 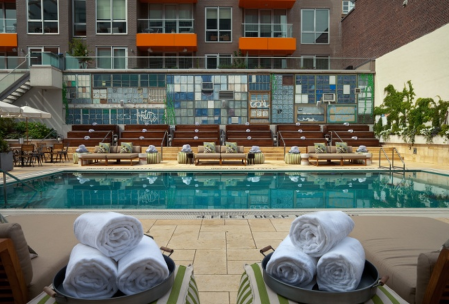 The pool is available for use by non-hotel guests as long you purchase a $150 all-day pass which grants you access to the gravity fitness center and the rooftop pool. The pool opens up Labor Day weekend. You can book HERE. 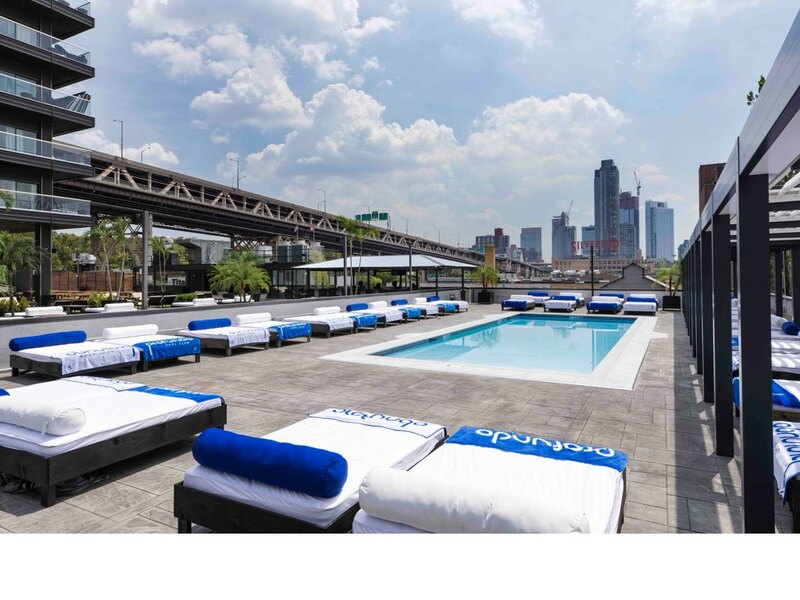 The 17th floor rooftop pool offers beautiful views of the city skyline and is open starting Memorial Day Weekend. If you are looking to get some sun without having to purchase a day pass you will love to spend your time here! The pool is open to the public starting at 3pm during the weekend and 5pm during the week! 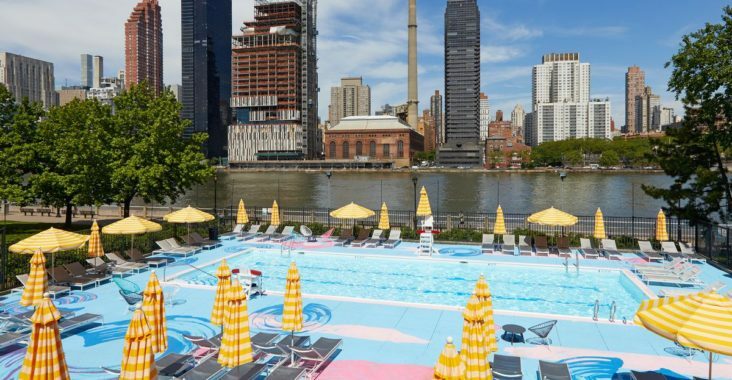 The 5,000 square-foot pool is surrounded by white sand, making it the only beach pool in Manhattan. The deck offers a full-service bar and DJ booth. Day passes start at $55 Monday-Friday for non-hotel guests. Note: All information is correct at the time of this post. However, we are not responsible if the facilities change their pricing or rules. Thanks for these options. I didn’t expect them to charge as much so this is a great heads up for my summer trip.